Even with all the reminder and to-do apps out there, plenty of people are still fond of physical sticky notes. And if you don't want to pick one over the other, there's a startup trying to bring the best of both worlds together. 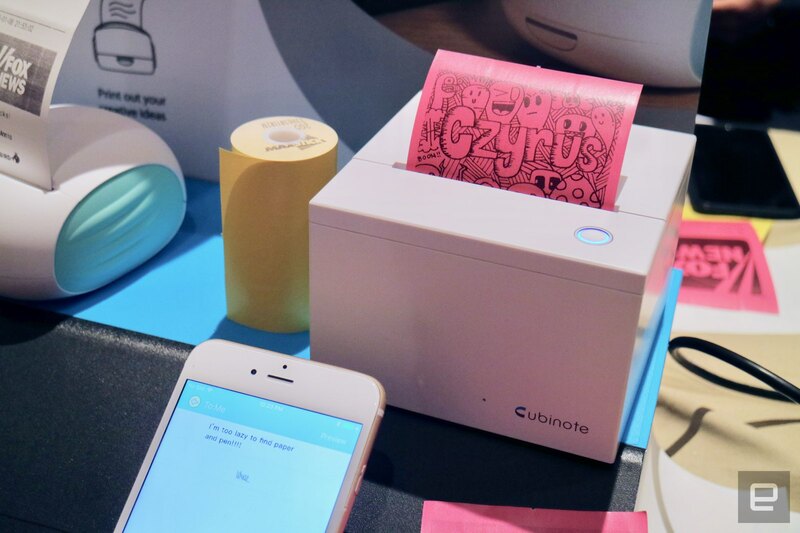 Cubinote is a Bluetooth- and WiFi-enabled printer that pairs with an iOS or Android app to make sticky notes on the fly. The company says the product could come in handy if you, say, want to leave it at your home office and send reminders or other random notes to it from your workplace. Or if your parents don't live in the same city as you and you want to send them messages every now and then. This works well because while the Cubinote features Bluetooth, it's also a WiFi device, making it possible to connect to your phone from a long distance. It's essentially like connecting to a Nest Cam or another Internet of Things product. One of the best parts about it is that the sticky paper it prints doesn't leave any residue where you place it, so you don't have to worry about the notes dirtying up your monitor, desk or anywhere else you stick them. The only downside is that it's not cheap: Cubinote's pricing its namesake sticky note printer at $149, which seems like a lot of money for such a niche product. If you like it, though, you can pick it up in March from Amazon and other retailers.